Too much of a good thing can be bad for ecosystems. The same fowl manure that makes your tomatoes grow so well can cause dead zones in the Chesapeake Bay. The nutrients in the manure—known as nitrates by scientists—access the Bay via tidal creeks and can be fueled in large part by wastewater from poultry processing plants, and chicken poop from large farming operations. Miguel Semedo, a Virginia Sea Grant Graduate Research Fellow and Ph.D. candidate at the Virginia Institute of Marine Science (VIMS) is researching tidal creeks as a window into the world of human impact on local ecosystems. Tidal creeks are home to a diverse range of birds, fish, and plants. Although these creeks are shallow and can be as short as two miles in length, they have a large footprint and are prone to heavy impact from human activity. They connect estuaries to inland areas, and nearby communities directly affect the streams. “Since they are in that interface between the land and the sea, they are closely exposed to the impacts from human activities on land, so it’s a good system for studying the impacts from human activities on coastal resources,” Semedo says. One such human impact is the poultry industry. Virginia was ranked 10th in the nation for production of broiler chickens in 2017 and is home to multiple major poultry plants. While wastewater from these plants is treated, nitrates and contaminants from some do reach the water in nearby tidal creeks. The nitrates can trigger a chemical process called eutrophication—when excess nutrients in the water stimulate harmful algal blooms. This process and its consequences may result in oxygen depletion in the water body that suffocates the fish and other organisms in the creek. These blooms create huge amounts of organic carbon and sugars. In a system with too much sugar, the bacteria expand their sugar-related activities and consequently use up all the oxygen in the water. As a result, finfish and shellfish lack the oxygen they need to survive. However, communities of microbes known as denitrifiers help offset these increases in nitrate levels. The denitrifying bacteria living in tidal creeks take nitrate from the water and convert it into atmospheric nitrogen—thereby preventing harmful algal blooms and the resulting dead zones and fish kills. Other contaminants such as metals, chlorine, or antibiotics from the poultry processing plants can impact the denitrifying bacteria, preventing them from filtering out the nitrate from the creek’s water. Without the activity of the denitrifying bacteria, the high levels of nitrate remain in the creek, which Semedo said can be anywhere from 10 to 50 times greater than natural levels. To study whether contaminants in the water impede the denitrifying bacteria, Semedo focused on two tidal creeks on the Eastern Shore of Virginia: one that receives treated wastewater from a processing plant and one that doesn’t receive wastewater discharge. He collected sediment samples from different sections of both creeks and compared them according to their distance from the processing plant. “Microbes are capable of almost anything metabolically and the way they shape the environment is so powerful. They are so essential to everything,” says Semedo. Back in the lab amid glassware, pipettes, and the quiet whirring of instruments, Semedo studied the denitrifying bacteria that live in the sediment. He measured how many denitrifiers were present in deposits from different parts of the creek, and used labeled nitrogen to measure how much nitrate the bacteria were able to process. Since the denitrifiers of the tidal creeks include a variety of different bacteria, Semedo also worked to identify which bacteria were most susceptible to the contaminants and which types of bacteria may be more resistant. 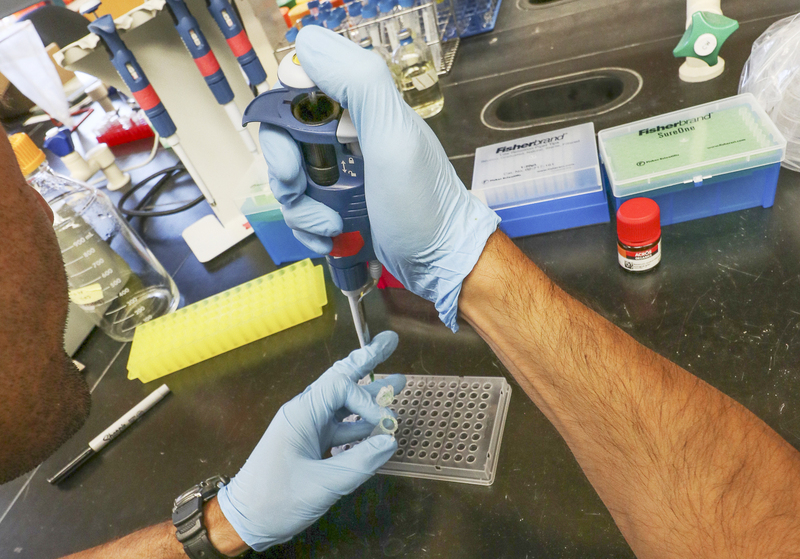 Using a process called next-generation sequencing, he has already identified one class of denitrifying bacteria that is less abundant nearer to the processing plants. Although Semedo is still analyzing the data he collected, he has presented some preliminary results to local communities and organizations. His work toward determining how the poultry processing plants are affecting the tidal creeks and the denitrification process may help guide the policy process. As scientific understanding advances, permits can be updated to make sure they protect local waterways. As the Virginia poultry industry expands, more communities are asking questions about how resources like tidal creeks will be affected. Tidal creeks connect estuaries to inland areas and are directly affected by nearby human activity such as wastewater from poultry processing plants. Denitrifying bacteria that live in the creek sediments filter out excess nitrates from the poultry processing plants, but other contaminants can hinder these helpful bacteria. Miguel Semedo’s research helps quantify how contaminants are altering the microbes’ activity. Talking with local organizations was very meaningful, and realizing the interest of everyone in this research.